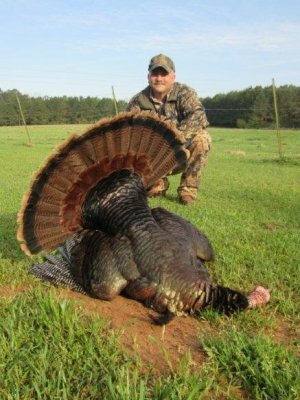 Come turkey hunting with us in Barbour and Henry County, AL and enjoy some of the finest gobblers on the eastern edge of Alabama’s famous black belt. We are located in Eufaula, AL, 50 miles north of Dothan, AL and 85 miles east of Montgomery, AL. We have several different tracts of hunting land, ranging from river bottoms, hills, hardwood bottoms, clear cuts, and pines. 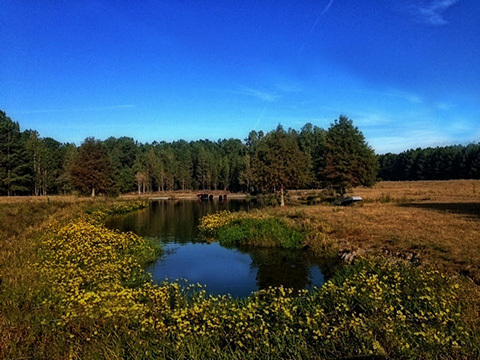 All of our properties are private hunting land with the game being intensely managed. Our hunting lodges are clean and comfortable. Both hunt lodges include furnished kitchens. Hunters should bring their own food or plan to eat at nearby restaurants, or we can cater your evening meals with some of the best southern food you will find anywhere. The dogwoods are blooming and the turkeys are sounding off. This is one of the most exciting times in the Alabama woods. We have had a high success rate on mature turkeys weighing 17-22 pounds in the past 5 years. If you have never experienced a big turkey drumming and strutting only yards from you, then you have missed a great experience. 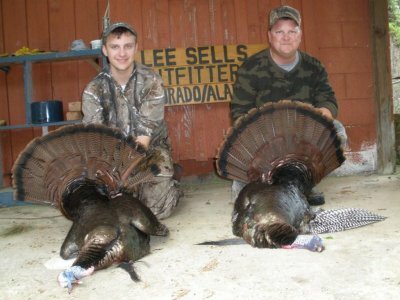 We offer a guided turkey hunt or an unguided turkey hunt. Our guided hunt is with an experienced guide who can get you right on top of the action. You will hunt with your guide for the morning hunt, and in the afternoon, we will place you in a strategic point such as a chufa patch or a strut zone. Success rates for turkey hunting are normally high. Our unguided hunt for the more experienced hunter is also just as exciting. We begin by giving you a good orientation of the property you will hunt. We will show you where the turkeys are and how to get to them, then it is up to you to put your turkey hunting skills to the challenge. Most hunters are very successful and enjoy the satisfaction of outsmarting a turkey on their own. We like to limit our turkey hunters to a maximum of 4 to 6 hunters in camp. Everyone has plenty of area to hunt, and no one will interfere with your hunt. Get in a kick start hunt in Alabama before your season opens! Give us the opportunity to call that big turkey for you next spring. Setting up on a turkey is a huge part of your hunt in order to be successful. Turkeys tend to want to head to certain areas when they fly off the roost each morning. Knowing where the turkey wants to go to be near his hens is the key. Turkey hunting can be done by setting up and passively calling a turkey, or by closing the distance yourself. You can actively do both to get the best results. Early spring is mating season for turkeys. Males surrounded by hens will not be as responsive to hen calls because they are surrounded by potential mates. Turkeys in search of a mate, however, will be very eager to seek out a calling hen. Later in the season, after most mating is done, turkey yelps and calls will be more effective than hen calls because they tend to flock together for the summer.